A unique data set of post-war English trained soccer players that signed professionally with their parent club when they turned 18 is used to study the impact of their stay with the home team and their total career duration. The home team (first) spell and career durations of these soccer players in a top European leagues is modeled using robust hazard models. The results of the analysis show that players that start their professional careers after acquiring training in competitive youth academy/programs have different outcomes on their career and first spell duration depending on the clubs they start their training. The first spell duration analysis is performed to estimate the bond or loyalty factor established by clubs with their youth trainees. The spell analysis outlines the nature of the competitive environment in which smaller clubs have a chance to keep up with the larger ones in terms of producing and holding on to home- grown talent. This would be a necessary condition for them to remain competitive in light of their lagging financial resources that limit their activity and ability to attract top talent in the soccer transfer market. The analysis of career duration in the top European leagues will show the success of a specific academy's training programs in producing players competitive in top soccer leagues. Finally, the results of both analyses were tested for endogeneity bias using a split sample test. Radoman, Mihailo, & Voia, M.-C. (2013). 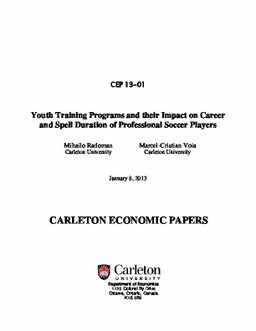 Youth Training Programs and their Impact on Career and Spell Duration of Professional Soccer Players (No. CEP 13-01). Carleton Economic Papers (CEP). Department of Economics.